Review date: 12 February 2002. If you have to deal with multiple flavours of memory card, you may have noticed that it's something of a pain. If you've got a digital camera that uses CompactFlash (CF) and an MP3 player that uses SmartMedia (also known as Solid State Floppy Disk Card or SSFDC, which is why you might prefer to call it SmartMedia), plus a palmtop organiser that uses MultiMediaCard (MMC), then, well, I think you should have chosen your gadgets more carefully. It's probably your considered opinion that I should pull my darn head in on the subject of your taste in digital devices, since it's not helping you to get data onto and off of all of those different cards. Your problem is that if you want to move data to and from those three types of cards and your computer, you either have to buy three separate reader-writers (or just "readers", as they're usually called), or dip your toe into the unsavoury world of combo devices. Physically connecting three separate memory card readers to a PC is no big deal. Most readers are USB, these days, so if you've got a PC with four root USB ports and no more than one of them in use, then plugging in three card readers is dead easy. If you're out of ports, just need to buy yourself a USB hub. Also easy. But you still need to pay for three readers, which probably won't give you a lot of change from $AU200. And three more cables is probably more than you want to deal with, too. Combo-readers, with two or more kinds of card slot in one USB-connected unit, save money and fuss compared with single-format readers. They're often more cheaply made, though, and slower, and may have fascinating driver issues too. I was, accordingly, ready to dislike this product. It's EagleTec's ET-FPTM USB External 3 in 1 Flash Drive, it has slots for CompactFlash, SmartMedia and MMC, and it only costs $AU121, delivered within Australia, from Aus PC Market (Australian shoppers can, as I may previously have mentioned, click here to go to the Aus PC site). 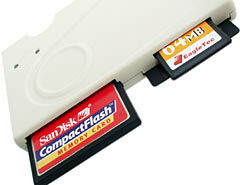 The CompactFlash slot in this reader will work with both Type I and Type II CF cards, including the IBM Microdrive. Which is nice. 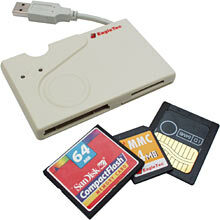 The MMC slot, though, is MMC only; you can't use it with Secure Digital (SD) Cards. SD Cards have the same form factor as MMC, but they include copy control technology akin to that in Sony's "MagicGate" Memory Sticks. 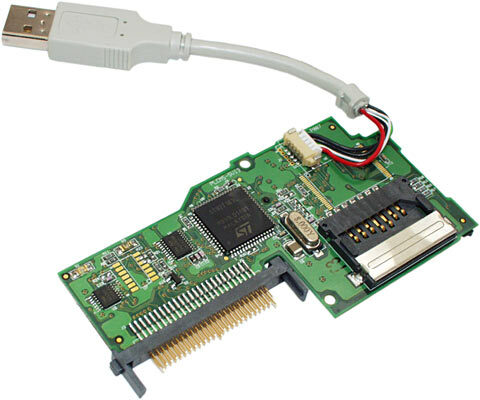 MultiMediaCards can be used in SD Card devices, provided you're not trying to use them to do anything that the content owners don't want done; SD Cards can't be used in plain MMC devices. This combo-reader also has the cheap kind of card slot for all three formats - there's no push-button eject or push-in, push-out operation for any card. You just push 'em in (label up for CF and MMC, contacts up for SmartMedia) and pull 'em out. The cards all stick out a fair way when they're plugged in, but that makes it easier to grasp them for extraction. There's no huge advantage to fancier eject mechanisms, mind you. The contacts in the EagleTec reader ought to last, and it doesn't feel terribly plasticky. It doesn't feel like a Swiss watch either, but you really can't complain, considering its size. It's sitting on top of its driver floppy disk, here. The reader has slightly more area than a business card, and it's a bit thicker than three stacked floppies. So it's not a problem to pack. The ET-FPTM connects to a PC with a USB connector that's attached to only about three centimetres of cable. The connector tucks neatly into the back of the reader for transport, as you can see in the above picture. This is a good compromise between cable-less readers (like the Datafab one I review here) and long-wire devices; you can attach the EagleTec reader to any USB port in a pinch, and if you need a long cable you can just buy a Type A male-to-female USB extension lead. Under Windows 2000, XP or ME, the EagleTec reader works as a USB Mass Storage Device, which means you just plug it in, without having to fool with any drivers. Actually, this reader's three Mass Storage Devices; each slot shows up as a separate drive. Chug chug chug goes the hard drive, and bing, the thing's installed. Little green light for power. Little red light for activity. Off you go. The ET-FPTM might work under Linux, too; the Linux kernel's had Mass Storage Device support for a while. All Mass Storage Devices are not the same, though, and many plug-and-go Windows storage devices either need fiddling to make them work in Linux, or won't work at all. For the driver-list-perusing information of Linux-lovers, a peek inside the reader's case revealed the main chip to be an ST Microelectronics 92T163L. 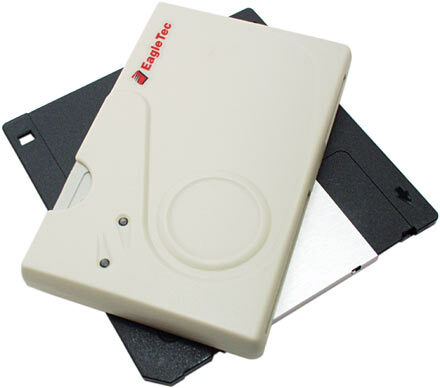 The EagleTec floppy disk contains drivers for Win98 and USB-capable MacOS, which makes sense. It also contains drivers for WinME and Win2000, which I found a bit confusing; I'm not sure what those directories are doing there. The driver download link on EagleTec's page for the ET-FPTM is no use for anything, though, so you'd better back up the floppy if you think you're ever going to need what's on it. In WinXP, I found the EagleTec's default drive letter assignment policy was a bit odd. Plug the reader in and it'll be assigned the first three free drive letters. No problem there. But if there's only one card in the reader, that card slot will always be given the first of the three drive letters, no matter which slot it is. With three cards inserted, the ET-FPTM assigns the first letter to MMC, the second to SmartMedia and the third to CompactFlash. It may do the same thing with two cards, or it may not, depending on which two slots you use. I tried using WinXP's Disk Management to hard-assign drive letters to the three slots, and that worked, but only when all three had a card in them. If I only inserted one card before connecting the reader, it got the first drive letter again. And two-card combinations varied. You may find this behaviour handy or annoying, depending on your application. Shifting drive letters can play hob with automated systems, but if you're only going to need one card slot at a time, you might like it to always, automatically, be the same drive letter. Combo-readers commonly have crummy read and write speeds. You'd expect them to perform poorly if you're transferring data from one card to another - since it all has to go through the host PC - but even for plain read/write operations, combo-readers tend to score at the low end of the scale. The card reader I use every day is the Datafab one I reviewed here; its write speed is below 400 kilobytes per second, but its read speed is above 900kb/s. That's not important if you're not moving tens of megabytes of data, but when I'm sucking more than 200 megabytes of thrilling product pictures off my digital camera's CompactFlash card, it's pleasing to be able to do it at most of a megabyte per second. USB CompactFlash readers with less than half the Datafab's read speed are still quite easy to find. And, unfortunately, the EagleTec reader is one of them. It's not the slowest card reader I've ever seen, but it's a darn long way from being the fastest. For SmartMedia and MMC, the ET-FPTM's read and write speeds didn't differ much. About 190 kilobytes per second each way for SmartMedia; a rather miserable 130kb/s each way for MMC. CompactFlash performance was better, but still not thrilling; 330kb/s write speed, 360kb/s read speed. The Datafab reader's not significantly faster than this for writes, but it reads data from CompactFlash at better than 2.5 times the speed of the EagleTec. Out of morbid curiosity, I tried copying a big file from CompactFlash to SmartMedia. The reader managed about a 100kb/s transfer rate for that. Life is too short for me to try the same trick between MMC and one of the other formats. Most people aren't using memory cards that are big enough for read/write speed to be a big deal. USB devices don't tie up the computer while they're working (in the bad old days of parallel port card readers, your PC was paralysed while the data flowed), so if you're not in a hurry then the EagleTec reader will do you just fine. Do something else while the data moves; who cares if it takes ten minutes. If you intend to make use of this thing's Microdrive compatibility, though... well, I hope you're not planning to shift the entire capacity of a 1Gb Microdrive very often. Filling one of those will take 50-odd minutes, and reading its entire contents will be only slightly faster. This isn't a perfect product, but it's pretty darn good for the money. For less than the price of two big-brand card readers you get compatibility with the three most popular flavours of memory card, the ability to read and write all three simultaneously, and no-drivers installation on current Windows flavours. Sure, the ET-FPTM isn't blazing fast, and its Amazing Shuffling Drive Letters feature might irritate you. But it's neat, and it's cheap, and it works. Even if you only need two of the formats it supports, it's worth buying. Recommended. Aus PC Market don't sell this reader any more - they have better, cheaper ones!